Soil texture exerts a definite influence upon the number of armadillos present in a given area. Those soils that are more easily dug, other factors being equal, will support a greater population density. In the sandy soils of Walker County, a population density of about one armadillo to 1 ha is common; in Brazos County, where the soils are more heavily impregnated with clay and become packed during the dry seasons, density averages one to 4 ha. In the rocky terrain of the Edwards Plateau, the animals tend to concentrate in the alluvial stream bottoms and den in the cracks and crevices of the numerous limestone outcroppings in that area. In the backland section of Texas, where the soils are heavy clays, the animals are extremely rare and restricted to the vicinity of streams where they can burrow into the banks and probe for food in the relatively soft soils near water. Perhaps the most important factor contributing to the distribution of armadillos is the hardness of the soil during the dry season, because the food of the animal is obtained largely by probing for insects and other forms of animal life in the ground. Armadillos are fond of water; where climatic conditions tend to be arid, the animals concentrate in the vicinity of streams and water holes. Tracks in the mud around small ponds give evidence that the armadillos visit them not only for purposes of drinking and feeding, but also to take mud baths. Excess water, however, has a limiting effect on them because they avoid marshy areas. Few animals of comparable size have so many dens per individual as the armadillo. The length, depth, and frequency of occurrence of their burrows depend somewhat upon soil conditions. In sandy areas the animals are extremely active diggers; in addition to numerous occupied burrows, one finds many that have been abandoned or are used only occasionally as shelters. In central Texas, the majority of their dens are along creek banks whereas in the sandy soils of east-ern Texas they are found almost everywhere. On the coastal prairies the sandy knolls are especially sought as den sites more because of protection from floods than because of ease of digging. In the Edwards Plateau natural caves, cracks, and crevices among the limestone outcroppings afford abundant shelter; excavated burrows are few in number and usually shallow. Dens vary from 1 to 5 m in length and from a few centimeters below the surface to a depth of 1.3 m. Averaging between 17 and 20 cm in diameter, their plan is usually simple, with few turns except those caused by obstacles such as roots, rocks, and so forth. Many of the shallow burrows serve as food traps in which insects and other invertebrates take refuge and to which the armadillo goes on his foraging excursions. Burrows that are used for breeding purposes usually have a large nest chamber 45 cm or more in diameter and containing the rather loosely constructed nest of dried leaves, grasses, and other plant items. These materials are merely stuffed into the chamber and the animal pushes its way in and out each time the nest is used. Usually, each occupied burrow is inhabited by only one adult armadillo. Because of their almost complete lack of hairy covering, armadillos are easily affected by climatic conditions. In the summer season they are more active in the cool of the evening and at night, but in midwinter their daily activities are reversed and the animals become active during the warmest part of the day, usually in mid-afternoon. They do not hibernate nor are they equipped to wait out long periods of inclement weather. Long periods of freezing weather effectively eliminate armadillos from an area. Of special interest is the behavior of this animal in the water. Its specific gravity is high and the animal normally rides low in the water when swimming. Apparently it tires easily when forced to swim for any distance. If the stream to be crossed is not wide, the armadillo may enter on one side, walk across the bottom, and emerge on the other side. If the expanse of water to be traversed is of considerable extent, the animals ingest air, inflate themselves, and thus increase their buoyancy. 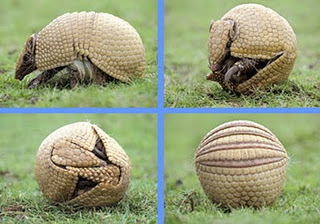 The physiological mechanism by which the armadillo can ingest air and retain it in its digestive tract to increase buoyancy is not known, but it appears to be under voluntary control. Many legends have arisen concerning the food habits of armadillos. Among the rural folks in the South they are commonly called “gravediggers: and are thought to dig into human graves and dine upon the contents. Also, they have quite a reputation as a depredator of quail, chicken, and turkey eggs. A study of their food habits by examination of more than 800 stomachs revealed that no fewer than 488 different food items are eaten. Ninety-three percent (by volume) of their food is animal matter, chiefly insects and other invertebrates. Among the insects, nearly 28% were larval and adult scarab beetles' forms that are highly destructive to crops and pastures; termites and ants comprised about 14%; caterpillars nearly 8%; earthworms, millipedes, centipedes, and crayfish appeared conspicuously in their diet at times. Reptiles and amphibians comprised only a small part of their diet these were captured usually during periods of cold weather. Birds eggs were found in only 5 of 281 stomach. Observation by field workers strongly indicate that the armadillo, which usually leaves conspicuous signs of its presence, often is accused of the destruction of quail and chicken nests when the culprit is actually some other animal. More than two-thirds of the slightly less than 7% of vegetable matter in the diet was material ingested with other food items and represents nothing of economic importance. Berries and fungi made up 2,1% of the entire diet. Reports indicate that at times the armadillo may feed on such fruits as tomatoes and melons but the amount of damage done to these crops is relatively small. Carrion is readily eaten when available, and dead carcasses of animals frequently are visited not only for the carrion present but also for the maggots and pupae of flies found on or near them. Reproduction in the nine-banded armadillo is marked by two distinct and apparently unrelated phenomena: the long period of arrested development of the blastocyst prior to implantation (delayed implantation), and the phenomenon of specific polyembryony, which results in the normal formation of identical quadruplets. In normal years about half of the females become pregnant by the end of July, which is the beginning of the breeding season. At 5-7 days the ovum forms a blastocyst and passes into the uterus. At this point development ceases, and the vesicle remains free in the uterus. Here it is constantly bathed in fluids secreted by the glandular lining of the uterus, which supplies enough nutrition and oxygen for survival. Implantation does not occur until November, about 14 weeks after fertilization. During this process, the blastocyst divides into growth centers, each of which very shortly redivides to produce four embryonic growth centers attached by a common placenta to the uterus. Development of each of the embryos then proceeds normally, and the, four young are born approximately 4 months later in March, although some females have been noted with new litters as early as February and as late as the latter part of May. Young are born fully formed and with eyes open. Within a few hours they are walking, and they begin to accompany the mother on foraging expeditions within a few weeks. The nursing period is probably less than 2 months, but the young may remain with the mother even after weaning until they are several months old. Normally the young born in one year mature during the winter and mate for the first time in the early summer of the following year. This phenomenon of delayed implantation may, in part, account for the successful invasion of the armadillo into temperate regions. Without this characteristic of the reproductive cycle, the young would be born at the beginning of winter, when their chance of survival would be greatly reduced. Apparently, the reproductive cycle is easily affected by adverse environmental conditions, particularly drought conditions. This probably is due to the shortage of ground insects or the difficulty of obtaining these in sandy or hard dried soils. Armadillos are believed to pair for each breeding season, and a male and a female may share a burrow during the season. Because of the bony carapace and ventral position of the genitalia, copulation occurs with the female lying on her back. Armadillos are frequently utilized as food in parts of Texas and Mexico. The meat is light-colored and when properly cooked is considered by some the equal of pork in flavor and texture. The common occurrence of this species in eastern Texas is a phenomenon that has developed largely since 1900. When Vernon Bailey published his Biologi-cal Survey of Texas in 1905, he mapped the distributional limits of the armadillo as between the Colorado and Guadalupe rivers with extra-limital records from Colorado, Grimes, and Houston counties. By 1914 the armadillo had crossed the Brazos River and moved to the Trinity River, and along the coast had already reached the Louisiana line in Orange County. The northward and eastward range expansions continued over the next forty years; and by 1954 the armadillo was known from everywhere in eastern Texas except Red River and Lamar counties. By 1958 it was known from these latter two counties, and today is abundant everywhere in the region. Apparently pioneering was most successful in a riparian habitat, and invasion was especially rapid parallel to rivers, which served as dispersal conduits. Average invasion rates have been calculated as from 4 to 10 km per year in the absence of obvious physical or climatic barriers. Possible reasons for the armadillo northward expansion since the nineteenth century include progressive climatic changes, encroaching human civilization, overgrazing, and decimation of large carnivores.